Prof. Dr.-Ing. Josefina Ballarre was born and raised in Argentina. In 2003, she graduated from the National University of Mar del Plata (UNMdP), Argentina, with a Major in Materials Engineering. From 2004 to 2009, Prof. Ballarre took a doctoral degree in Materials Science at the same place. 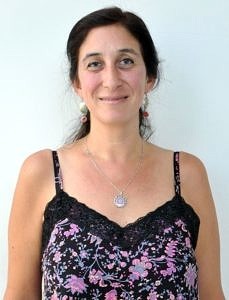 She is an adjunt researcher of CONICET (National Scientific and Technical Research Council Argentina) at the National Institute of Materials Science and Technology (INTEMA) in Mar del Plata and associate professor at the Engineering Faculty of UNMdP as well as the Head of the Materials Engineering Department. Besides her research and teaching activities, Prof. Ballarre works as an ad-hoc reviewer for the international journals “Materials Science and Engineering C: Materials for Biological Applications” and “Acta Biomaterialia” among others. Furthermore, in 2008, Prof. Ballarre received the Outstanding Oral presentation Award for her work entitled “Coatings containing silica nanoparticles and glass ceramic particles applied onto surgical grade stainless steel”, which was awarded during the 21. International Symposium of Ceramics in Medicine-Bioceramics in Buzios, Brazil. In 2010, 2011 and 2013, she won together with her research group at UNMdP the Carlos Ottolengui Award for their research in traumatology by the Argentinian Association of Orthopedia and Traumatology. Since May 2018, Prof. Ballarre has been a guest researcher at the Institute of Biomaterials lead by Prof. Dr.-Ing. habil. Aldo R. Boccaccini at the Department of Materials Science and Engineering at FAU. Her stay is supported by the Georg Forster Research Fellowship for experienced researchers of the Alexander von Humboldt Foundation. Together with researchers from FAU, Prof. Ballarre will further he research on bioactive and antibacterial hybrid coatings for complex geometry surgical orthopedic and dental implants. I am a passionate researcher that tries to bond biology, chemistry, physics medicine and materials science, looking always to create and repair, as all engineer wants! Prof. Ballarre, what is your field of research? My field of research is the surface improvement of metallic implants to enhance bioactivity, bone attachment – for example the fixation of the implant to the old bone – and to reduce the prosthetic rejection, which can cause movement of the implant or infection. My background is in Materials Engineering but I am a passionate researcher that tries to bond biology, chemistry, physics medicine and materials science, looking always to create and repair, as all engineer wants! What were your reasons for choosing FAU as your host institution for a research stay abroad? I have been in several countries and institutions, also here in Germany, doing different stays abroad, but the Institute of Biomaterials at the Department of Materials Science and Engineering caught my attention since I was here in 2016 for a short visit. The research approach at the Institute is highly interdisciplinary and covers broadly the field of biomaterials beyond the “classical” boundaries between materials classes and processing techniques. This successful approach is reflected in the research outputs of the institute and this appealed to me. In addition, the great laboratory facilities, the excellent group, the international character and a prestigious and remarkable leadership of Prof. Dr.-Ing. Aldo Boccaccini convinced me to choose FAU as my host institution for the Georg Foster Alexander von Humboldt for Experienced Researchers Fellowship. In the field of Materials Science and Engineering, and especially in the Biomaterials field, the Institute of Biomaterials conducted by Prof. Boccaccini is highly known and respected. He is also one of the responsible heads of the DAAD funded cooperation programme I.DEAR (Ingenieure Deutschland-Argentinien) in the Materials Engineering field between two German Universities, namely the Universität des Saarlandes and FAU, and the UNMdP, my home university where I work as a professor. It´s in its fourth year of running with high success. The possibility of exchanging students and academic staff within the frame of this cooperation gives Professor Boccaccini, the Institute of Biomaterials, the Department of Materials Science and Engineering and FAU in general an excellent reputation within the Argentinian and Latin American community in my field of work. How do you find the interaction between researchers at FAU? I noticed that FAU researchers are a truly collaborative community. They complement each other in exchanging knowledge, in the use of equipment, in students´ formation and in sharing lectures and workshops. This is a very interesting point since the interdisciplinary mode is the perfect way to understand society problems, and to try to solve them. The interactions between researchers and students at FAU is really valuable and a great example to other institutions. I notice, for example, that research at the Institute of Biomaterials is carried out in close collaboration with colleagues at other FAU departments and faculties. This is not always obvious and I can see that this collaboration across disciplines is an important strength of FAU. Could you give us a short description of the project your research group is working on? In Argentina, I am a Project Leader in the Applied Electrochemistry Division of the INTEMA (National Institute of Materials Science and Technology), and Professor in the Materials Engineering Department of UNMdP. We work in protecting, functionalizing and enhancing bone attachment of metallic implants used in orthopedics and dentistry. The two main research directions involve the modification of metallic surfaces with an anodic film, which is a controlled grow oxide, and with a silica based sol gel coating. To this last layer we can add bioactive particles, which then act as starting points for the bonding of bone tissue to enhance bone formation. This particular topic overlaps strongly with one of the research areas and the expertise in Prof. Boccaccini’s Institute. And what is your role in the research group? I joined the group in Argentina in 2000, as an engineering student. As one of my colleagues says, I am Founding Partner of the Metallic Biomaterials research group at the Institute. Now I am a researcher and group leader, having the responsibility to carry out several projects, to teach in the Materials Engineering and Biomaterials field, and also to respond to demands of industrial partners, thus contributing to solve “metallic biomaterials problems” in the local industrial sector. Here at the Institute for Biomaterials, I am leading a project supported by the Alexander von Humboldt Foundation together with Prof. Boccaccini, which aims to produce protective and functional coatings on metallic implants. We are improving the deposition of silica based sol gel coatings onto plane and complex shaped metallic surfaces by an innovative, simple and non-expensive method: spraying by airbrush gun. It allows us to cover complex shapes as bone fixation screws and also allows us to incorporate into the coating particles or fillers with specific biological functionalities. Another excellent technique to modify the surface of biomaterials is to deposit thin layers by a room-temperature process called electrophoretic deposition, a field in which Prof. Boccaccini is a word leader. We are enhancing the bioactivity response of permanent implants with bioactive glass particles and the new coatings we are developing should have the extra capability to avoid infections by the smart combination of nanoparticles and antibiotics. In addition, for temporary implants, those that must be removed from the body after a certain period of implantation, the new structured coatings should enhance corrosion protection and prevent bacterial colonization of the surface of the implant. What benefits can society in general expect as a result of your research? There is pressing need worldwide to develop innovative biomaterials with dual functionality, for example with the ability to bond effectively to host tissues like bone in case of orthopaedic implants and the capability to avoid infections. It is well known that the cost of implant failures to the public health system is very high. 50 per cent of hip implant rejection is due to poor fixation and bacterial infections. In Latin America metallic implants, that are not always the premium ones, are frequently used due to the associated costs. The results of our project should contribute to tackle this problem, as it will result in robust, protective, bioactive and antibacterial coatings for low cost metallic implants, applying cost-effective and simple techniques that could be implemented easily by the local implant manufacturing industry. All German history is exciting, and also the places where it took place. You have to take into account that my country, Argentina, is 208 years old, and your University is 275! So every place that we are going to – I am here with my husband Diego and my two kids Paulina and Enzo – is a piece of history and a new adventure. We love the Bavarian history of beer and the tunnels made to preserve it during the hot season. We very much enjoy every castle and palace that we visit in the region. Also the forest and hills around Erlangen and Nuremberg are an excellent environment to complement all the historic and typical architecture of the cities and old towns. We obviously know Erlangen better now as we live right in the city centre, but other favourite places in the area are the cities of Rothenburg, Regensburg and Nuremberg itself. Until now, for a large margin, the highlight of my stay in Germany has been the meeting with the Federal President of the German Republic! 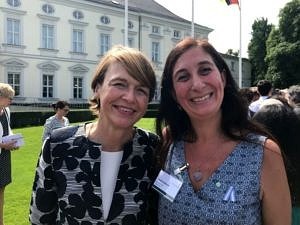 As Humboldtians we were invited to the Bellevue Palace in Berlin to listen to the President´s speech and to spend some time with him and the Humboldt President and secretaries at the residence garden. A highlight was when Dr. Frank-Walter Steinmeier, his wife and Prof. Dr. Pape, President of the Alexander von Humboldt Foundation, came to talk with a colleague and me about implants, about FAU, Materials Engineering and football. It was a very interesting and exciting moment. I can also mark the welcome to, presentation of and integration into his institute by Prof. Boccaccini as a highlight of my stay so far. He is an invaluable part of this important Fellowship, from the moment I decided to make my application to the Humboldt Foundation until now, that our project is running. One of my favourite places at FAU is the new building of the Institute of Biomaterials in the Ulrich-Schalke-Strasse. Nice environment next to the forest, great and modern construction, top facilities, lots of light and air. Also I very much like to go to the Schloss in the city centre, near the Botanic garden. 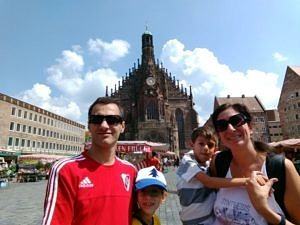 My children very much enjoy to go there. As I told you before, the Nuremberg tunnels and the historic centre of Nuremberg with all the walls and towers around the city are one of our favourite places, too. Our stay at FAU would not be possible without the encouragement and support of a great mentor: Thanks to Prof. Boccaccini who gave me the inspiration and motivation to present this project to the Alexander von Humboldt Foundation. But also this stay would not be as easy-going and natural as it is for me and my family without the support of the FAU Welcome Centre. They helped us from searching for accommodation and a school for our daughter to receiving us from the very first day, guiding us with all the paperwork that a foreign researcher has to do when he or she arrives to a new city and institution, so that we always felt welcome and our integration was smooth from the start. Thank you for the interview, Prof. Ballarre.